Apoptosis, or programmed cell death, characterized by nuclear condensation, cell shrinkage, membrane blebbing, and DNA fragmentation, plays an important role in many physiological and diseased conditions. Monitoring the cell's progression to apoptosis, detecting the apoptotic cells, and developing drugs that regulate the apoptotic pathways are the essential parts of basic research. Additionally, many diseases like cancer, autoimmune diseases and neurodegenerative diseases, like Alzheimer's Huntington's, and ALS involve either a failure of apoptosis to eliminate harmful cells or the inappropriate activation of apoptosis leading to loss of essential cells. The complexity of apoptosis regulation and the large numbers of molecular players in the apoptotic signaling pathways provide ample opportunity for developing therapeutics to modulate the pathway. 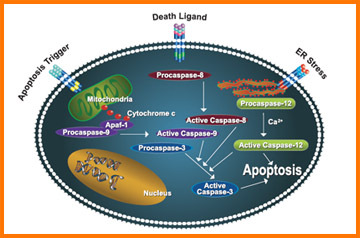 Apoptosis can in general be divided into membrane mediate, cytoplasm mediated, mitochondria mediated, nucleus mediated and non-caspase mediated apoptosis. BioVision has developed various assays and products that can detect apoptosis at the early, middle, and late stages in apoptotic cascade.